Takeout Kit is a meal subscription box aimed at helping you explore international food at home. They provide all of the hard-to-find global ingredients you need to complete the recipe right at home. Each month, Takeout Kit will send the ingredients to a globally inspired dish that ups the ante on your favorite takeout cuisine. According to Takeout Kit, all of their ingredients have a two-month shelf life, so you can cook your meal right away or wait until you have a free night to indulge. Takeout Kit got a makeover for the new year! I love the new illustration on the box; it was fun trying to find the meals that I’ve cooked right on the box. The Cost: $29.99 a month + free shipping. Save with 3 and 6-month subscriptions. The Products: The ingredients you need to make takeout-inspired meals from around the globe. Takeout Kit‘s menu assortment is quite extensive. Currently, you can choose from 16 offerings. 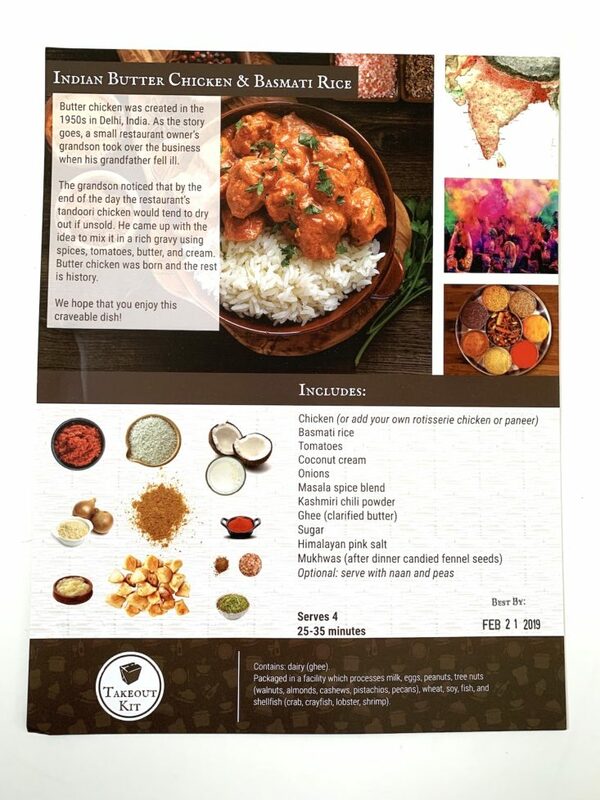 This month, I received the Indian Butter Chicken & Basmati Rice Kit. You can read a bit of history on each takeout meal along with the region in which it originated on the info card provided. On the flip side of your info card, you’ll find your recipe along with a visual guide to what supplies you’ll need (pots, pans, etc.). Takeout Kit sent this chicken out for the Peruvian Creamy Yellow Pepper Chicken Kit as well (see review here). It’s not bad, but I will always prefer fresh chicken to shelf stable meat. I’ve used these tomatoes many times, and I’ve always had excellent results. This is a great, affordable and readily available product in my area, thankfully! This ghee is from grass fed cows and is USDA certified organic. I’ve also tried this product through Takeout Kit before, and it is tried and true! 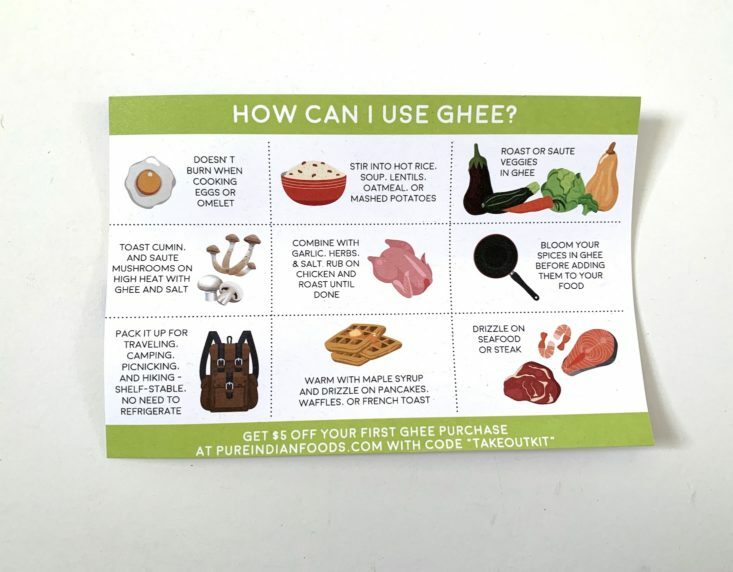 I am a ghee convert, and I have Takeout Kit to thank for that. They provided this handy info sheet for anyone curious or new to this product. This was the star ingredient to this dish, without it, this dish wouldn’t have that rich, creamy texture and sweetness. These always smell sooo good as soon as you open the box. Takeout Kit loves to send them, and I love to eat them! They always plump up really fast when soaked in water. Masala is a blend of spices typically found in Indian cuisine including aromatic spices like cumin, tumeric, and coriander. This recipe forewarns that this is a spicy powder, and it really wasn’t too bad. I used over half, and the dish had just the right level of heat for me. This is one of my favorite types of rice; these grains are long and fragrant, perfect for this dish! I had to sneak a taste, of course, while cooking this meal, and they were just a little potent for me. Here are the ingredients used for step one: the rice making! I rinsed the rice, and I put the ghee, rice, salt, and water into my rice maker. I really liked the inclusion of the ghee to my rice, which is something I may start doing here out. I then opened (and drained) the pouches of chicken, tomatoes and coconut cream in this step, too. Prep Step 2 includes hydrating the onions in a ¼ cup of water. The first step to this dish is warming up the remaining ghee in a pan and browning the rehydrated onions..what a delicious aroma! After the onions are browned, I added the Masala and Chili spices to the pan forming a terracotta paste that smelled amazing! The next (and final) step is to add the remaining ingredients to the pan with the paste we made. I added the chicken, coconut cream, tomatoes, salt, and sugar to the pan and mixed them all together. And right at this point my rice maker just finished steaming. Is there anything better than a steamy bowl of rice? Here is the finished butter chicken! I only had to simmer this mixture for 10 minutes before plating it with my fluffy, long grained rice. This meal was excellent! It was the easiest meal kit I’ve ever cooked, and you’d have no idea that I didn’t spend all day making this sophisticated, sweet and savory dish (because the flavor was awesome). I love the spice that the chili powder brought, and the coconut cream added such a creamy, sweet indulgence that went perfectly with the rice underneath it. Verdict: Indian Butter Chicken & Basmati Rice Kit was delish! Hat’s off to Takeout Kit for putting the easiest meal kit together. This dish, although I am not an expert in Indian cuisine, tasted authentic, and the flavors really developed after only 15 minutes of “actively” cooking. Love it! This subscription is great for anyone who loves to try new, cultured dishes. The instructions are foolproof, even for those non-cooks out there, especially with this particular dish. I love that everything is provided for you in the box, and it is shelf stable for weeks until you are ready to make it. Can I still get this box if I sign up today? Yes! Buy it here as a one-time box for $32.95. Value Breakdown: This monthly box costs $29.99 a month, including free shipping. This Takeout Kit serves up to four people, which comes to about $7.50 per plate. Check out all of our Takeout Kit reviews and the Meals Subscription Box Directory! What do you think of this Takeout Kit dish? Abby has been a box enthusiast since July 2011, finding her calling with Birchbox. 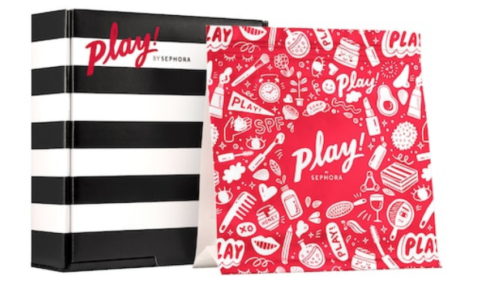 That was the start of a new era for Abby, because she is now hooked on the subscription box life; she loves the idea of receiving (several) thoughtful treats from genius curators such as Lisa Sugar and Rachel Zoe. A few other loves of hers would be her dog named Bill Murray, Bill Murray and chocolate babka. How do subscribers rate Takeout Kit? Do you subscribe to Takeout Kit? Add your rating now! That chicken looked gross. George Carlin meat cake gross. I’m waiting for my order of Indian food to arrive for dinner while I read MSA, so this is making my mouth water & stomach rumble! I agree that real takeout might be cheaper than this kit (depending where you live) but it is interesting to see how useful some of these shelf-stable products can be. And of course there’s the convenience factor! Actual takeout would be better and cheaper than this kit. Agree. Dried onions? Just throw a real onion in the box.